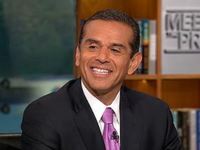 Secretary Villaraigosa? Not So Fast. “I have said many times I will be focused on my job as mayor of Los Angeles until 11:59 and 59 seconds on June 30, 2013,” he said. If LaHood were willing to stick around a few months longer, Villaraigosa could still be in the running, seeing as his term as mayor ends July 1. LaHood was already planning to stay on as department head until a new one could be named, a process that’s expected to take two months, meaning that LaHood would throw his goodbye party in late March or early April. Would he wait another three months for Mayor V? At the moment, no one’s asking him to, and the federal government doesn’t make a practice of waiting for city officials to clear their schedules. But it’s worth noting that if that’s truly the only deterrent against a Secretary V, it’s not that high a hurdle. If this ends up being the end of the story, though, it’ll be a shame. Sustainable transportation advocates were enthusiastic about the prospect of Villaraigosa heading up the department. I talked to our own Damien Newton, editor of Streetsblog LA, this morning. He said the mayor’s vision in pushing Measure R, the 2008 sales tax measure funding the city’s major transit expansion, shows he’s got the stuff to be a great secretary. Villaraigosa was at the top of most lists of contenders, so if he is out, who’s in? Former Pennsylvania governor Ed Rendell has been mentioned, but he recently told a reporter, “The president would not be interested.” That’s not exactly the same as saying he wouldn’t take the job, but he’s probably right. Not only is Rendell “too critical of the lack of transportation funding,” as he said, he also wouldn’t do anything for cabinet diversity. Granholm said Michigan’s economy would only be rebuilt by “building the economy from within by curbing ruinous sprawl and traffic, reviving troubled cities, enforcing environmental law and safeguarding Michigan’s natural heritage,” Schneider wrote. In addition to Transportation, Granholm has been mentioned as a possible Labor secretary. She was once discussed as a possible Supreme Court justice. One way or another President Obama appears to be looking for a place for her in his administration. Another name that’s circulated in recent days is that of National Transportation Safety Board Chairwoman Deborah Hersman. The Wall Street Journal wrote yesterday that “she is expected to get the nod barring a sudden change of direction by the White House.” Hersman is a Democrat but was originally a Bush appointee. Though her work has generally revolved around high-profile train and plane crashes, her advocacy for a cell-phone ban for drivers would safeguard pedestrians and cyclists too. Vulnerable road users haven’t been a big part of her portfolio, but someone with such a strong focus on safety would presumably understand that complete streets are safer streets. Streetsblog readers have made clear that NYC DOT Chief Janette Sadik-Khan has their vote. Eno Transportation Center President Joshua Schank agrees, saying she “would be almost the ideal candidate.” She has the experience of running one of largest DOTs in country, she’s a technical expert, and she has political wherewithal to handle the job, Schank said. But we can’t help noticing that we haven’t seen her name on many roundups of DOT contenders lately. Yet another former governor — Christine Gregoire of Washington — had been mentioned for the job. A month ago, it was reported that Obama was on the verge of nominating her for EPA administrator, though that hasn’t happened yet. She’s clearly a superstar and everybody likes her, but her promotion of the Columbia River Crossing and the Alaska Way Viaduct are two marks against her in any sustainability advocate’s book. Former FAA Administrator Jane Garvey, who’s also filled the top slot at FHWA, served on Obama’s transition team as an advisor on transportation issues. She was suggested in 2008 as a possible secretary and some still think she has the chops to do the job. Another woman — are you sensing a pattern? — whose name has been floated is former Texas senator Kay Bailey Hutchison, though the speculation was stronger before the election, as a possible secretary for President Romney. If Obama wanted to replace LaHood with another Republican, she would be one choice, but he’s already crossed the aisle by nominating Chuck Hagel for defense secretary. Not even an ironic jab at say, Gov. Gregoire, for talking almost entirely about highway spending while standing before a backdrop of spanking new trains. Villaraigosa has his eyes set on Governor. Period. LaHood isn’t leaving until a new SecTrans is *confirmed*. Given the US Senate behavior, that could be 2016.